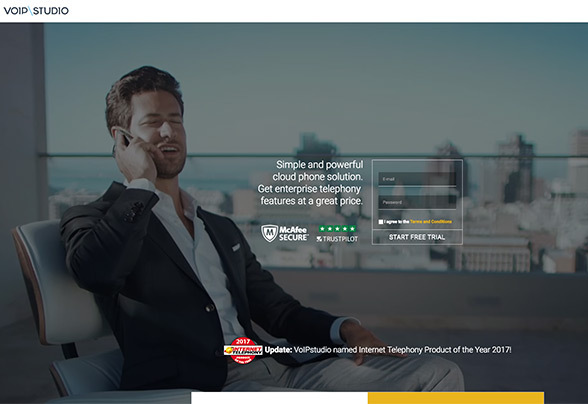 VoIPstudio is a great cloud phone system for business, offering Pay as You Go or monthly bundles for national and international calls. They have a powerful PBX system for internal communication, great business tools and 24/7 customer support. There are three options available for customers at VoIPstudio. The Pay as You Go subscription is the cheapest monthly cost, at only $4.99 per user per month. You will get instant deployment of your VoIP system, 24/7 customer support and all the advanced features which VoIPstudio offers. Users can then choose to add on virtual numbers in more than 4,000 global cities. Customers can benefit from free number porting and inbound calls. If your business simply wants an internal PBX and the use of internet calls, this is a great option. If you think that users will benefit from a free bundle for outbound calls, and your business mainly deals with one other location, the most popular option should be the National plan. This costs $19.99 per user per month, and includes a 2000 minute bundle for each user to one country of their choice. A geographical number will also be included. Some are free with the National and International plans, while some will incur an extra fee of anywhere from $10-$20, plus a setup fee. 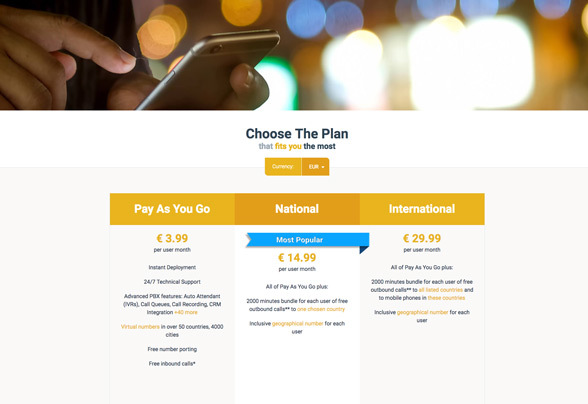 The International plan jumps in price to $39.99 per user per month, but allows users to call any of the listed countries, including certain mobile phone locations too. The same restrictions apply to the National plan, so make sure to take a look at the lists of telephone numbers when deciding if VoIPstudio is a good fit for your company. The value for money really depends on how many countries your business has dealings with, and whether these are inclusive of your monthly package. Nevertheless, compared to other VoIP plans as well as traditional POTS, international calls are competitive here. Because the company uses 1second billing, you end up paying for exactly what you use- no rounding up to the nearest minute costing you extra. VoIPstudio is made for business use, and the company ensures that they are packed with useful tools and productivity options. As well as the free internet calls and low cost outgoing calls you would expect, VoIPstudio allows for number porting free of charge, and virtual numbers in more than 4,000 cities globally-giving your company a real global presence. At this time, there are no options for vanity numbers. Each user has their own web portal to manage call forwarding or voicemail, minimising on admin tasks. In many ways a virtual receptionist, your auto-attendant system will support call waiting, extension dialling, ring groups and call parking. One of the best features of VoIPstudio is how portable it is. You can use the system anywhere you have the internet, including your desktop computer, your mobile or your at home WiFi. If you prefer to have hardware, this might improve the quality of your calls, and VoIPstudio can provide Deskphones, DECTphones, VoIP adaptors and any accessories you might need from the website. Set up really does take minutes, and there is no installation required. You may need to download a softphone for your operating system, or use some of the many tutorials on the website to learn how to activate new extensions or use certain features. There are also integrations with Salesforce and Oracle, as well as Microsoft Dynamics CRM, Cisco 79xx and Avaya 1x. Live chat is available from the website if you need any help getting started or managing your system. 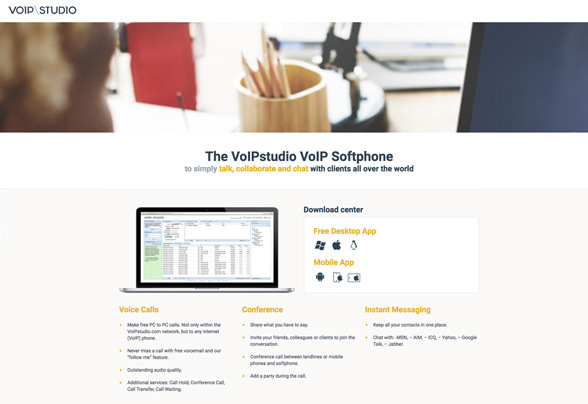 The native SIP client used by VoIPstudio means that your users can use the PBX or cloud phone system from any iPhone or Android device. Customers can turn any phone into an office extension, whether it’s in the same country or abroad, and whether it’s another building full of staff or a standalone staff member working from home. Another great extra is Multipoint Registration. This means that each use can register multiple end points for the same extension. Whether staff are at their desk, at home, or on their mobile-they won’t miss a call. The Follow Me system automatically forwards calls to other numbers when staff aren’t available, redirecting the calls to another member of the team or someone else who can help. Everything users need to know is accessible from the website. There are dozens of tutorials on every aspect of sign up and set up, from adding new extensions, to working out conference calls or call hold settings. The tutorials are by video and are simple to follow step by step. Reliability is a concern for anyone who is using an internet phone system. VoIPstudio has data centers in four locations to guarantee the best quality possible, plus Internet Fallover Protection in case of a system failure. We love the status page, which informs customers of how all elements of the hosting system are doing, and is updated in real-time. This is a great way to check if all systems are go, and troubleshoot your own internal issues if need be. If you need additional help, there is a live chat client on the website, as well as 24/7 phone numbers from many global locations. Users can also send a contact form, if they prefer. Once users have signed up, they can submit support tickets for 24/7 help and guidance using the support portal. The 30-day free trial gives you ample opportunity to ensure you understand the system and get the help you need promptly when you need it. VoIPstudio can replace your existing telephone systems to provide free internet calls and low rate outgoing calls to more than 4,000 locations around the globe. 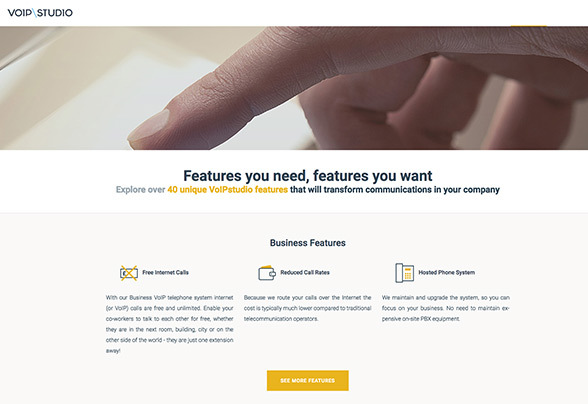 Our favorite features are the 30-day free trial, all the bells and whistles for business use, as well as the Pay as you Go subscription which is highly competitive, especially if what you need is an internal PBX. Setting up multiple geographical or toll free numbers can be costly however, and we would love to see an Unlimited plan making this hassle-free for large businesses. A great choice for any business looking for PBX and cloud phone. Copyright © 2009-2019 Natural Intelligence Ltd. All Rights Reserved. Reproduction in whole or in part in any form or medium without express written permission of Natural Intelligence Ltd. is strictly prohibited.